In my previous two blogs, I have made a start with the study of the BAM components. I have started with the Data Objects (BAM Data Objecten, BAM Calculated Fields). In this post I will talk about Queries. A business query or query is a request for data that matches specified conditions. 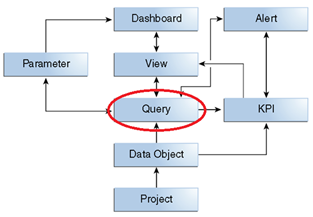 A query can fetch from a data object once, on a schedule, or continuously. A Flat SQL Query is a simple table of data fields and their values. You select the data object and then select the data fields. I will use this type, among other things, to show the number of days a task is open. A Group SQL Query query is an analysis of one or more numeric data fields, called measures, grouped by non-numeric data fields called dimensions. For example, a group SQL query might analyze cases grouped by department. You select the data object and then select the measures and dimensions. I will use this type also multiple times. For example to show Today’s Task Summary. A Tree Model Query, written in SQL, is an analysis of one or more measures grouped by a hierarchy of dimensions. For example, a tree model query might analyze cases grouped by Judicial system, Department, Team and Employee. You select the data object and then select the measures and a hierarchy. I will use this type to make the Organizational Hierarchy visible. Read the complete article here.